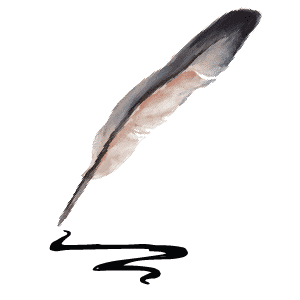 I am trying to come up with something clever to introduce this post… something witty or historical or fascinating. Nothing is coming. I’m totally blocked. I think it’s because I have The Great Gatsby on the brain (new movie is opening today, whoopee!!). It’s pretty much all I can think about. It’s one of my favorite books. I think I had a previous life in the 1920’s… I’m definitely a flapper at heart. Now, there’s always a possibility that this movie will be a huge disappointment. It’s a great American novel, and my expectations are pretty high. For now, I remain optimistic and excited that young people are being inspired to read Gatsby… for pleasure, and not just because their high school teacher told them to. So here’s the thing. Gatsby and Crispy Panko Fish have nothing to do with one another. I tried in vain to find a connection, but no luck. Since I’m a bit preoccupied today, I’ll simply give you a brief explanation of how this dish came to be, then you can go to it. It all started with orange chicken. My family loves this spicy-sweet orange chicken from our favorite Chinese takeout place. Several months ago I experimented till I came up with a great “copycat” orange chicken recipe, which we now enjoy once every few weeks (it’s deep fried and topped in sweet sauce, so we try not to overindulge). Last week I decided I wanted to try making a similar dish with some fresh cod I’d picked up at the market. 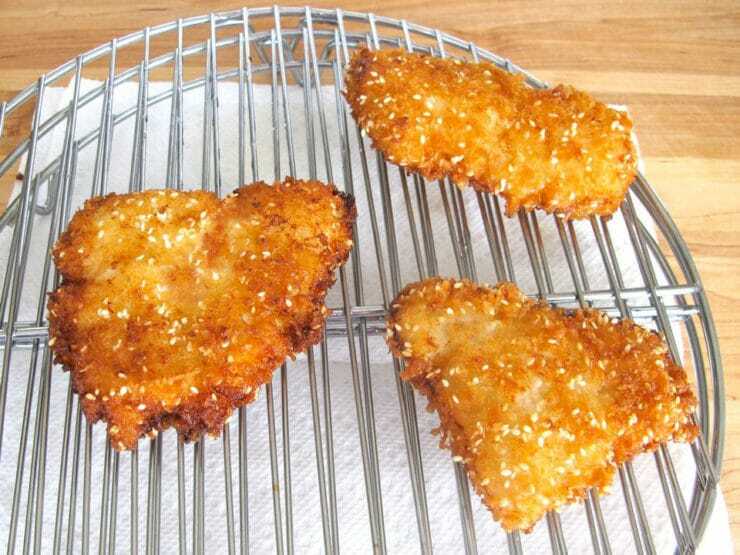 I used my favorite batter and panko fish coating, mixing in some sesame seeds for extra flavor and crunch. The panko cooked up super crispy and the fish was perfectly flaky inside. Then I drizzled the whole thing with orange sesame sauce. 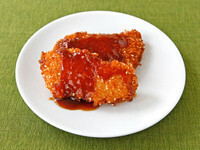 The whole family gave this Crispy Panko Fish with Orange Sesame Sauce a big thumbs up. It’s a fish recipe even your picky eaters will love. For reals! Okay, who else is excited to see Gatsby this weekend? Any other fellow flappers out there? Make crispy fried panko sesame fish with a sweet and spicy orange sesame sauce. Step-by-step photos and instructions. Kosher, Pareve. Cut fish (or ask your fishmonger to slice it) into single serving fillets no thicker than 1/2 inch - 1/4 inch thickness is optimal. 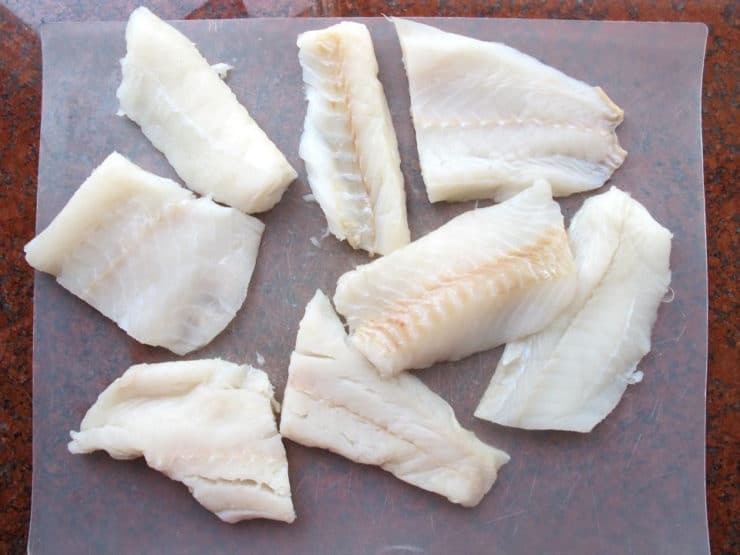 For irregularly sized cuts like cod, you may need to slice some fillets in half lengthwise to make them thinner. 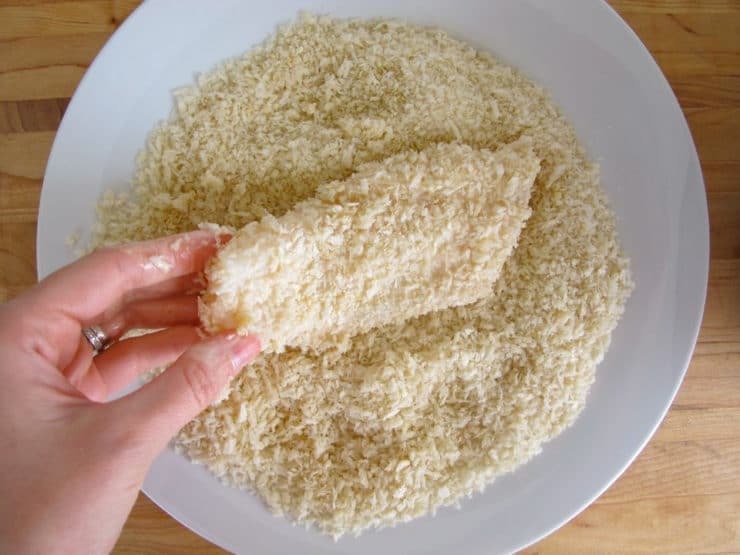 Alternatively, you can slice the fish into smaller bite-sized fish sticks, about 2 inches long and 1 inch wide (the smaller pieces will be a bit easier to manage in the frying pan). In a mixing bowl, whisk together the seltzer, flour, cornstarch, salt, garlic powder, and cayenne to make a batter. The batter will bubble at first, then settle. 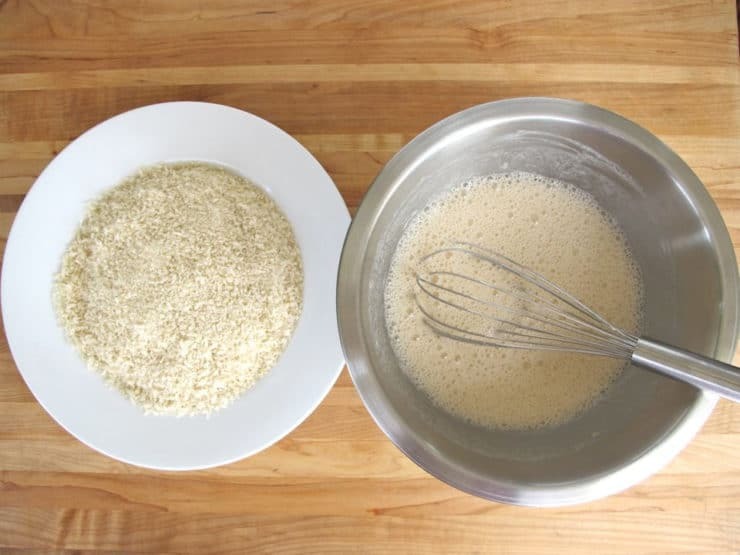 Stir together the panko breadcrumbs and sesame seeds, then pour them onto a plate. Have an empty plate handy for the breaded fish. After dipping in the batter, gently roll each piece in panko crumbs to coat. 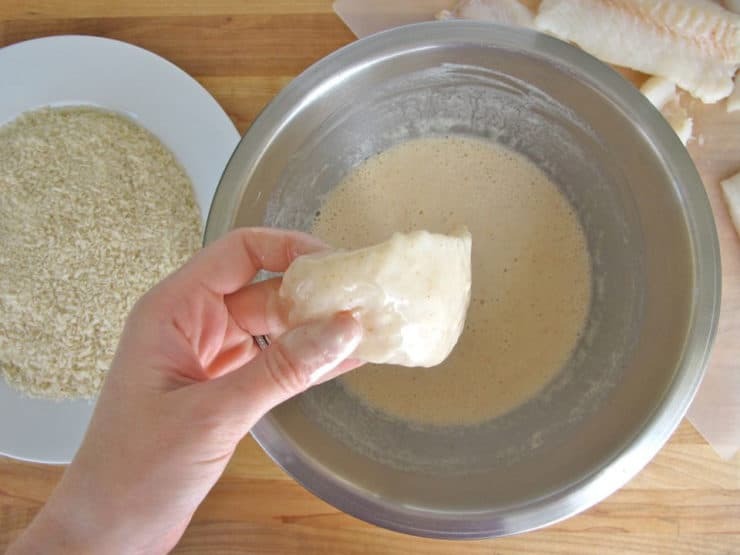 Leaving too much batter on the fish will lead to clumping and will make the coating fall off the fish when frying, so make sure your fish is only lightly coated with batter before breading. Place the breaded fish onto the empty plate. Heat ½ inch of vegetable oil in a skillet over medium till hot but not smoking. 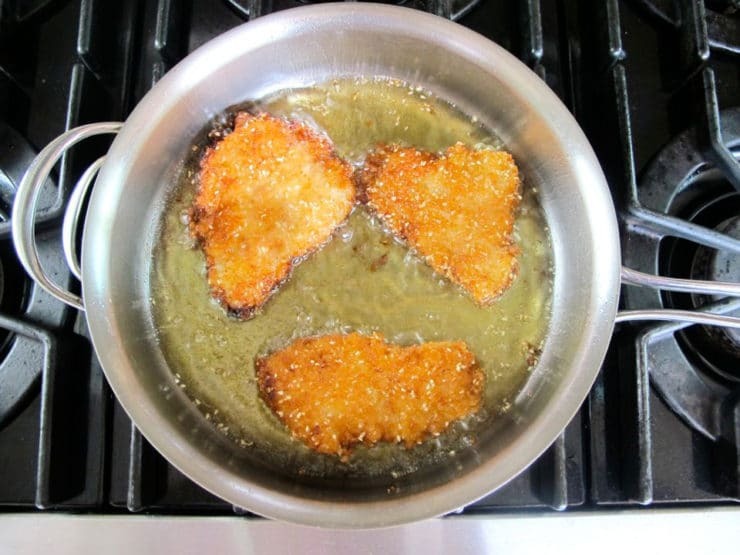 Fry the breaded fish pieces in batches of 3 (if using smaller sized fish sticks, you can fry up to 6 at a time). If the oil is at the correct temperature, it should bubble and sizzle evenly—no splatters or popping. Flip the fish when they turn dark golden brown. Don't flip them till they're completely golden-- the more you flip them, the more fragile the coating will become, so try to only flip each fillet once. If your oil is at the right temperature, it should take about 4-5 minutes per side for the fish to become golden and crisp. Once fish has drained, you make the sauce immediately and serve, or place the wire rack (without paper towels) on a baking sheet in the oven at 200 degrees F for up to 30 minutes till ready to serve. This will keep the fish warm, fresh and crisp. Just before serving, whisk together cornstarch and 2 tbsp water in the bottom of a small saucepan till dissolved. Whisk in orange juice, soy sauce, agave nectar, sesame oil and a pinch of cayenne. Heat the sauce over medium to a simmer for 2-3 minutes, whisking constantly, till it thickens slightly. Remove from heat and let it cool for 2 minutes. Serve fish hot drizzled with the warm orange sesame sauce. Great Rachel, thanks for reporting back! I love using panko for fish. Looking forward to trying this sauce. Happy Shavuot! I made this for supper last night and it was amazing! Now that I have the perfect crispy fish recipe, I need a recipe for Yushian sauce too…delicious, thank you! i cannot have soy sauce, sigh, would this still be totally wonderful without it? or is there something i could substitute. yes, i am a dreamer. Any idea what agave nectar might be substituted with in Israel? Not sure I have seen it around here. I’m dying to see that movie, loved the book. This looks delicious, and thanks for the mention of my Chinese Broccoli Salad; always appreciated! The Great Gatsby doesn’t open in the UK until next week, but I’ve booked our tickets for opening night on Thursday! 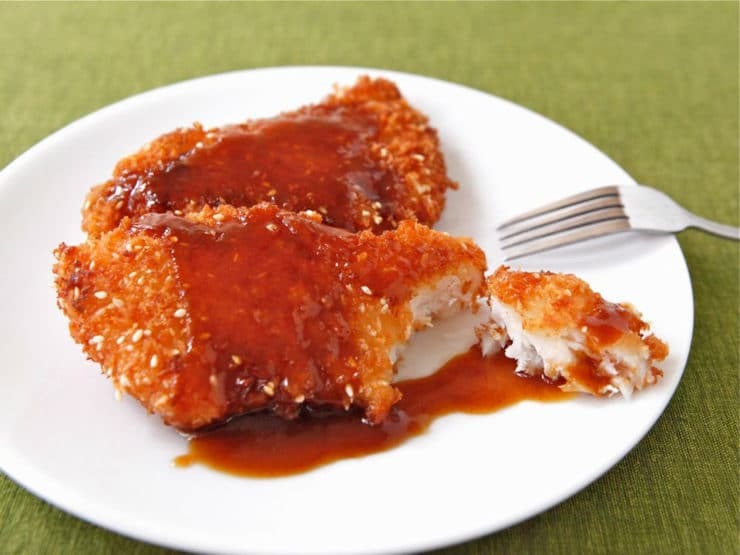 Like you, I have very high expectations, but I’m hoping it’s going to be wonderful 🙂 Your Crispy Panko Fish looks delicious, and the Orange Sesame Sauce – oh my! What a fabulous way to serve fish. Looks great, but I don´t do fried stuff! A fellow flapper… love it! Isn’t everything better with panko? The fish is much more exciting than the movie.